The small flowers of bittersweet nightshade, with their turned-back petals and yellow beak, remind vegetable gardeners of the flowers on tomato plants. Tomatoes, potatoes, peppers, eggplant and tobacco are all members of the nightshade family. The berries of bittersweet nightshade are attractive to many species of birds. Tiny purple flowers with yellow beaks, berries that ripen red throughout the summer to feed the birds and a name that suggests legendary poisons—bittersweet nightshade has them all. Bittersweet nightshade (Solanum dulcamara) is sometimes called climbing nightshade because it is a vine that climbs on other plants. It drapes itself over them rather than strangling them. The vine becomes woody with time and is also called woody nightshade. It begins to bloom in June and continues through the summer. It's not hard to find vines bearing flowers as well as berries in various stages of ripening. The vine's three-part leaves are distinctive. They have a large center lobe with two smaller wing-like lobes at the base. Look for bittersweet nightshade growing on other vegetation in sunny or partly sunny trailside areas with moist soil or in a weedy area of your garden or backyard. It also grows at the edges of parking lots, such as the dirt parking lot for the Bowman Conservation Area. It's a perennial, so you're likely to find it in the same place year after year. Bittersweet nightshade is one of a couple of plants with the "nightshade" name that grow in Westborough. What you won't find here is the true "deadly nightshade" of literature and lore, the poisonous belladonna plant (Atropa belladonna). All parts of the belladonna plant contain the poison atropine. Belladonna grows in central and southern Europe but is rare in this country. It has been reported in only six states, none of them in New England. Bittersweet nightshade may get its name from the taste—first bitter, then sweet—that comes from chewing the leaves. A chemical called dulcamarine creates this experience. Bittersweet nightshade is not deadly but neither is it good for you. The plant contains small amounts of another chemical, solanine, and perhaps others, which have stronger, potentially toxic effects on the body. Bittersweet nightshade can be toxic to livestock. To be on the safe side, children should not put the berries in their mouths. 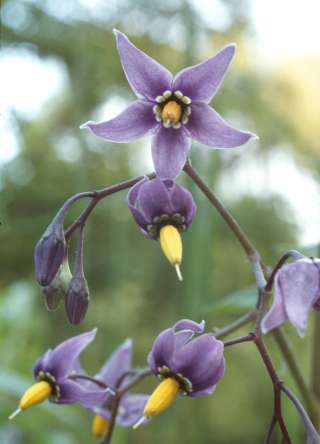 The small deep purple flowers of bittersweet nightshade have a distinctive look, with turned-back petals and a cone-shaped yellow beak. They do not produce nectar, but insects dine on the pollen. Because the flowers face downward, bees can't easily land on them or crawl into them. Instead, they hang upside-down on the flowers and vibrate their wing muscles to shake the pollen out. Vegetable gardeners may notice that the shape of the flowers seems familiar. They are similar to the flowers of the tomato plant (Lycopersicum esculentum), which is in the same family, called the nightshade or potato family (Solanaceae). Tomatoes were once regarded as poisonous. Other agricultural plants in the nightshade family include the potato (Solanum tuberosum), the eggplant (Solanum melongena), various peppers (genus Capsicum), and tobacco (genus Nicotiana). The fruits of bittersweet nightshade--the berries--have no place on our dinner table, but they do have other fans. As the berries ripen throughout the summer, turning from green to orange to red, they provide a bonanza for the birds. More than 30 species of birds eat the berries. Wild animals, including skunks, also eat them. Bittersweet nightshade came to this continent from Europe, where one of its old-time uses was to ward off the effects of witchcraft. Apparently it was worn around the necks of both people and domestic animals for this purpose. Like many plants containing chemicals that are potentially toxic to us, bittersweet nightshade has had some medicinal uses in the past. It has been used externally to treat skin problems, including warts, infected toenails or fingernails, tumors, and eczema. It has also served as an ingredient in remedies for rheumatism, kidney problems, and respiratory ailments such as bronchitis, asthma, and whooping cough.